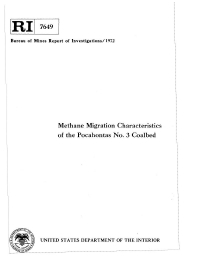 Methane-flow and pressure data taken from a mine in the Pocahontas No. 3 Coalbed are compared with flow rates from lump coal obtained in laboratory experiments. From this, it is concluded that the main source of gas is the intact coalbed rather than a "crushed zone" near the working face. The permeability and sorption capacity of the intact coalbed are calculated and gas emission rates are theoretically accounted for.